In my previous posting I mentioned all the fun and games we had as children in Pontypool Park, but there was one place which we visited only occasionally – the Grotto – mainly for two reasons: we had to pay to get in (though sometimes it has been free) and we had to climb a 700 foot hill in order to get there. While we sat down to regain our breath we always admired the magnificent view from the top of the hill. Of course, once there, the Folly Tower beckoned and it was only a short and not-very-steep path to get there. I never thought about it as a boy, but just imagine the work involved in getting all the materials, local sandstone and stone tiles, to the top of the hill by horse-drawn transport back in the eighteenth century. 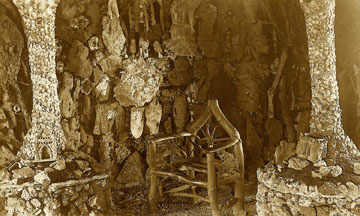 The Grotto was commissioned and designed by Molly Anne Meirs in 1784. She was a well-known beauty who was very wealthy and very benevolent and a keen collector of shells of all kinds. Her married name was Molly Anne Mackworth. She lived in Gnoll, near Neath where she’d built another grotto. She was widowed at the young age of 20 and it was after this that she married Capel Hanbury Leigh and became John Hanbury’s daughter-in-law. 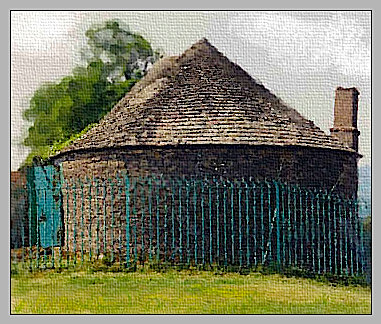 The building serves no real practical purpose except that it was sometimes used by the Hanbury family as a hunting lodge on some of their local hunting trips and for the occasional picnic. On one of the hunts in 1882 they were joined by the Prince of Wales. I think the idea that it was the home of a hermit is nothing more than a local myth though, it is rumoured, that at one time someone was employed to live there as a hermit which might account for the establishing of the myth. I remember that, on entering the Grotto, we had to wait a short while so that our eyes grew accustomed to the dim light inside, but, when we got used to it, it was amazing how much detail we could see. Part of the wall just inside the door was made of rustic timber, and there was also rustic armchairs which were not very comfortable to sit in. The Grotto is built around six pillars leading up to a fan-vaulted roof and has been described as the finest example of its kind in Wales. 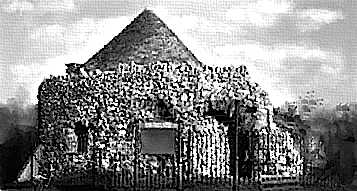 Blott Kerr-Wilson, who has won awards for her designs of shell houses and shell furniture, described it as a “Shell House” which is not a bad description except that the floor is not made of shells but bones and teeth set vertically into it in intricate patterns so that only the tops of the bones show. Other materials such as coal slag, rocks, iron and glass were also used to represent local industries. The aim of the designer was to make it look as though Nature did it. In short she brought the seaside to Pontypool Park. The shells, which were used to embellish the building, probably early in the nineteenth century, are a mixture of common shells widely found in this country, such as cockles, mussels, periwinkle and limpets and also a smaller number of exotic shells from other countries, such as oyster, conch and cowrie. I remember there was one oyster shell with a pearl inside it; I don’t know whether it’s still there. The next time I saw cowrie shells was when I went to live in Nigeria. A short time earlier cowrie shells had been used as currency in that country and I was told that, while I was living there, they were often also used in their fertility rites; the design of the cowrie shell makes it obvious why this was so! 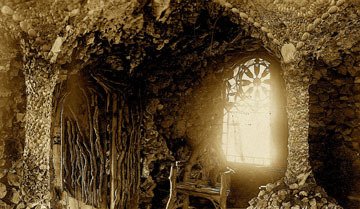 After almost 200 years of wear and tear in a very vulnerable position with regard to the weather, and after suffering at the hands of mindless vandals, the Grotto was closed to the public in the 1970s for repairs to the collapsed roof and crumbling walls. Owing to lack of funds the repairs were limited but in the 1990s, with the help of Cadw, the Heritage Lottery Fund and the European Regional Development Fund, enough money was made available for the complete restoration of the whole building. The work was done by specialist restorers; it was painstaking and slow taking four months to complete. Fortunately, over the years, many people, including myself, had taken a lot of pictures of the inside of the building, and some of these were invaluable in providing details for the accurate restoration. Today the building is occasionally the venue for musical recitals, poetry readings and story telling events. I’m sure Molly Anne Meirs would approve. In May 2009, I took my son and two grandchildren to Pontypool to see the Grotto. The trip was kindly arranged by Alex Andrews, the Park Manager, who took us up to the top in her landrover – essential as far as I was concerned. I hadn’t seen the Grotto for well over 30 years and somehow it seemed bigger than I remembered it and certainly very much brighter. I wondered whether this might be due to the excellent job of reconstruction which has been made on the building. This time I took some more photographs; in colour on this occasion which contrasted markedly with the previous black-and-white attempts of earlier years. I print one below. I’ve been living in the house for well over forty years, and yet I never take the view for granted; I continually appreciate it. 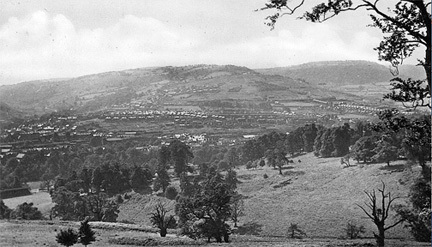 And so it was when I lived in Pontypool. We had a magnificent park of 150 acres which we were able to visit freely during the hours it was open and at any time of the year and we really did appreciate it. When I was old enough to venture that far on my own, I would go down, with a group of friends, and stay there for hours. It had everything a group of young lads could ask for: a playground with a variety of machines to play on, acres and acres of green grass to run about on or kick or bowl a ball, hiils to climb, conkers to find, horse-chestnuts to eat, a pond and a stream to look for fish, build dams and get wet feet and acres of bushes near the river to chase about and hide in. When we became teenagers we could also play tennis and even bowls. What more could we ask for? Then, of course, there were the special events, usually held on bank holidays. On those occasions the Pontypool Council was allowed to close the park and charge admission to enter. One such occasion was when the annual carnival took place. The long procession of entrants and floats wound its way through the town and ended up in the park where the judging took place and the winners were announced. I knew a boy, named Cecil Cleary, who lived in Hayden Street at the back of our house; he was about my age and every year his mother would dress him up as a red indian by using red floor polish. With his head-dress and indian clothes on he really did look the part and won first prize in his section for a number of years. I remember his mother once saying that she had to boil water for three baths in order to wash off the floor polish; there were no hot taps then, hot water had to be heated in a copper boiler or a kettle. The sports were also great fun and we spent hours sitting on the bank watching the competitors running, jumping etc. And, naturally, there were all sorts of ice-cream vendors and pop suppliers about if we had any money to buy their wares. I remember one year there was a display by a team of Russian Cossacks. I was mightily impressed by their riding skill and daring deeds jumping on and off horses while they were moving and jumping from one side of the horse to the other and back again etc. I found it all so exciting. The schools also made use of the park. Mr Petty, in the warm summer weather, would sometimes take a large group of boys down the park to play cricket. We only possessed six stumps, two bats and a cork ball, but we managed. I remember the challenge of one boy to Mr Petty: “How about a penny on the middle wicket sir?” He sportingly obliged by putting on the penny. The first bowler to hit the penny off the stumps kept it. The Sunday Schools also found the park a great boon. At Whitsun, Park Terrace Methodist Sunday School usually went down there for their party. Tables and chairs were taken down, together with a supply of jelly, blanc-mange and slab cake all washed down with tea drunk from a blue and white tin mug. Then would follow the sports, usually the running of various distances according to age, and also novelties like three-legged races, the winners receiving tuppence or so as their prize. 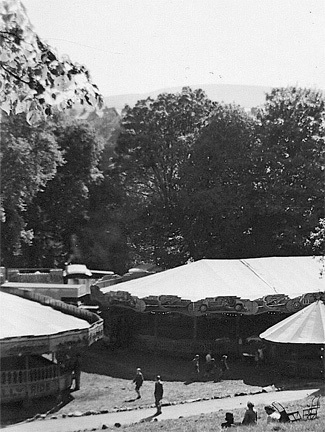 There was one event in the year which lasted for about a week; that was the visit of the Dante’s Fun Fair. We all looked forward to this and saved up a few pennies to use during its stay. We loved rolling our pennies down the chutes, trying our skill at darts and air-gun shooting and, when we could afford it, having a drive on the dodgems; how we loved chasing our friends! If the summer was particularly wet at fair time the turf would invariably get pitted and muddy with all the walking on it and complaints usually followed at the state of the ground when the fair had left. Sometimes there would be angry letters in the Free Press saying that the visit of the fair should be stopped. 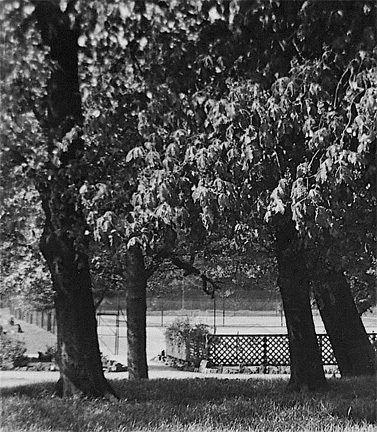 When I was an older teenager at West Mon School I’d often visit the park with a friend or two to play tennis, or sometimes a more leisurely round of putting. It was quite inexpensive so that we often had a small sum left to enjoy an ice-cream drink in the Italian cafe near the library. With today’s enhanced facilities at the Trosnant end of the park teenagers are able to enjoy their drinks in the restaurant. Over the years I suppose the park has given great pleasure to millions of people from Pontypool and its environs. May it long continue to do so. I’ve previously mentioned my aunt Phyllis who taught in Town School Infants. She married Percy Gregory and went to live in the house above the shop in Hanbury Road, Cwmffrwdoer. Years before, during the hard times of the depression, Uncle Percy’s father had built up a thriving business in the shoe trade by allowing people to have new shoes and to pay for them in instalments. Repairs were also carried out on the premises. I always admired my Uncle Percy. He was the sort of person sometimes described as a “gentle giant”. He was full of energy and always willing to help anyone. He was a member of Pontypool Toc H for many years. At the front of the house above the shop was the store room which contained hundreds of boxes of shoes and nearby was a very steep flight of wooden steps which led down to a door into the fitting room. It was almost vertical and, whenever I went down it, I carefully hung onto the rail at the side and was terrified in case I should fall. Consequently I was filled with wonder whenever I saw Uncle Percy descend those steps. He would put one hand on the rail and then jump down four of five steps, then another few and leap down the rest. I was always amazed at this daring feat. The three Gregory children, Michael, Anthony and Vera, were of course, our cousins and, although they were some years younger than my brothers and me, we always looked forward to visiting them. The whole family were very active in the local Pontnewynydd Methodist Church. They were a very generous family and we always felt welcome when we visited the house. During the war years they invariably put on a party when either of my brothers were home on leave from the forces. Aunt Phyll, somehow or other, even managed to produce sausage rolls as part of the fare, a great luxury at that time. And then, at Christmas time, there was the round of parties at our various houses on three or four evenings. When my grandparents were alive, the Christmas Day party was always at Osborne Cottage. It was in the greenhouse at the back of the Gregory’s house that I first came across yellow tomatoes. During the growing season, Aunt Phyll was always generous in providing us with a bagful to take home whenever we visited. But the place which fascinated me most was the wooden workshop which was also in the back garden. As a young lad I always asked to go there to see Uncle Percy and also his father repairing shoes. I marvelled at their skill and speed. First of all they would use a short but deadly sharp knife to cut out the new sole from a large sheet of leather. Then they would take a small handful of black tacks and put them up to their mouth, almost as if to swallow them, but instead they merely held them between their lips. Then, using a long iron bar, which looked to me rather like a file, they would take a tack out of their mouth, place it in position on the sole of the shoe and with one hefty bang drive it in, then another and another in quick succession. I was always amazed at the skill, speed and precision with which they did this. Then they’d take another handful of tacks and continue right around the sole of the shoe until it was all firmly in place. Then they performed something else I loved to watch. They would take a special hot iron with a wooden handle and apply molten black wax all around the edge of the sole, making it look like new. Michael Gregory lived at Osborne Cottage for some years and it was while he was there that he started teaching at West Mon School. I have had several emails from former pupils who remember him as a very popular teacher who treated then as grownups rather than boys. He later gave up teaching to become a Methodist minister with very successful ministries in both Abergavenny and Bristol. Sadly it was while he was ministering in Bristol that he died about nine years ago. His wife, Maureen, died shortly after him. Anthony also became a Methodist minister and has been very successful, with his wife, Elma in ministering to the people of Tenby. Vera is still living in Pontnewynydd not very far from the old shoe shop which, I understand, has now been converted into a house. 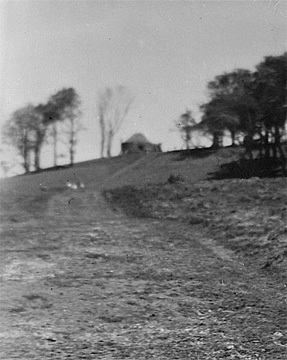 As I have already written in a previous post, from the age of eight I started walking to and from Town School four times a day. As school dinners for all who pay did not exist in those days I preferred the walking to having sandwiches for dinner. The only exception was in the extreme winter weather when a lot of snow had fallen and walking was very difficult. This was nothing unusual. I had a friend called Peter Knight who lived at Penygarn and was also in Mr Petty’s class. On a number of occasions he also walked home to dinner and then walked to School Lane to call for me before we both walked back to Town School. If you wanted to go anywhere in those days it was almost invariably on foot. Naturally, making the same journey twenty times a week became boring so I tried to vary my route. Sometimes I would go through town via George Street and Crane Street, and sometimes I would go up Broadway and down the Donkey Steps by the “old buildings” as we called them. They were not only old, they were wrecked. There was a third route which I took, just occasionally, but which was more lonely. On the way home it involved going down Crane Street and turning down the alleyway by the side of Sandbrooke and Dawe’s. This led to a narrow track just below the railway in front of a row of small, old cottages. It emerged in the upper reaches of George Street slightly lower than the bridge over the railway. There are several events which occurred on my journeys which remain vividly in my memory. On my way home to dinner I always walked on the right hand pavement along Wainfelin Road and always passed a row of about six old cottages which ended at the wide entrance to the field at the rear of the school. The doors of the cottages were always open and the people living there seemed to be very friendly, always chatting on the doors and popping into each other’s houses, so that I could never tell who lived where. One day as I was walking along that pavement, a couple of hundred yards short of George Street School, I suddenly noticed a huge cloud of smoke emerging from one of the cottages. As I got nearer, I could see violent flames inside the front room which shattered several of the windows and showered glass all over the pavement and road. Suddenly a man dressed in long-johns, and with bare feet, leaped out onto the pavement to escape the heat. I can only imagine that he had been in bed when he suddenly realised that the cottage was on fire. There was nothing I could do, of course, and the event scared me quite a lot especially as , on that particular day, my mother had had to attend an urgent appointment and had left my dinner at home for me. This was a very rare event indeed. In fact it was the only time I can remember it happening. Consequently I had no-one to tell about the fire when I arrived home. When I returned in the afternoon the fire had been put out but, it was obvious, that considerable damage had been done to the cottage. On another occasion I decided to take the route at the side of Sandbrooke and Dawe’s. After walking along the narrow lane for a hundred yards or so I was aware of a scuffling noise behind me. I turned around to see what was happening and, to my horror, I saw a sheep tied securely to a wooden trestle with a man wearing a large apron standing by the side. The sheep was kicking wildly which made the scuffling noise. Suddenly the man took out a large knife and plunged it straight through the neck of the unfortunate animal. I shall never forget the splashing noise made by the blood as it poured out on the stones. I stood frozen with horror for several seconds and then hurried on my way. It was well known that there was a slaughter house in that place but it was the first time I had witnessed any of the slaughter. There is another tragedy I also witnessed on the way home which happened right outside George Street School. At that time, motor transport was relatively rare and, it was a common sight to see a dog, out walking on its own, suddenly objecting to the noise of a car, van or motorbike, and running alongside barking and growling ferociously at it. It’s a sight never seen today. At that time there were a number of light, red Brooke Bond tea vans which were used to make deliveries to the grocery shops. They were quite noisy. Suddenly one came along Wainfelin Road and a passing dog chased it running alongside and barking. It obviously misjudges its position relative to the van and ran too close. Suddenly there was a loud bump and a cracking noise as the van struck the dog. I don’t know whether the driver knew of this or not but he van carried on along the road leaving the poor dog on its back in the gutter with its legs in the air. I shall never forget the pitiful howls it made as it lay dying. Such dogs would frequently be killed and would never reproduce which, I suppose is the reason that, today, dogs leave motor vehicles severely alone.